So, I guess I did a bit of Soul searching around the whole idea of blogging. I guess the answer I came up with was: If I dont tell my story and share my experiences with the world then what’s the point of doing this thing called life. Hell, if I find/do something and it could be helpfull or interesting to my friends, why not share it and let them decide if they want to use it. So, what have I been doing the last 2 weeks? To sum it up in one word ‘Snow’. Yes Cape Town had snow last weekend and we managed to find it. Very little of it, but still SNOW! 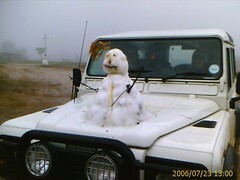 We made the trek out to Ceres last weekend in 2 trusty Landy’s in order to experience the wonders of frozen water. It was a 3 hour drive and it seemed that everyone else in Cape Town also had the same idea. This was my first ‘Cape Town Snow’ experience and although not a true snow virgin ( I have skied 3 times before in the USA) it was still fun to experience it in my own back yard. Visiting the snow in Ceres is for every Capetonian a right of passage and a pilgrimage like this validates your status as a true Capetonian (for all those born in Gauteng, this is one of the ways you can assimilate into Capetonian culture, although it does’nt give you ownership status). Anyway here are some of the photo’s I took with my phone. they will come. U popping round at the geek dinner?